of the BBC coverage of the impact of cuts on the disabled. This is a photo that I like, though perhaps it’s a little small to be appreciated here. 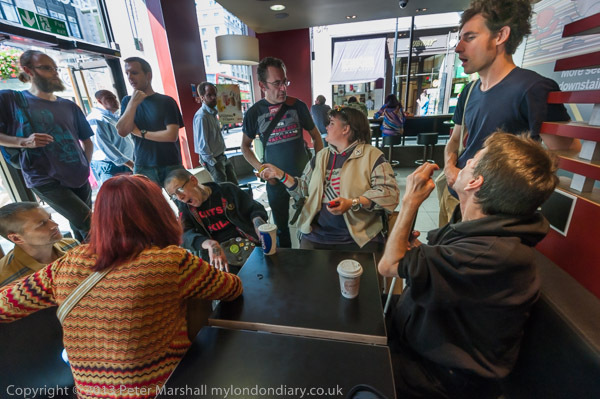 I’d been sitting for a while talking to the people around these two tables, who were part of a group of disablement activists, many themselves in some respect disabled, meeting up in a branch of Macdonald’s before going to protest unannounced at the doorway of the BBC’s new building in Central London. I’d just decided it was time I got to work, and taken out the D700 with the 16-35 wide-angle and was checking the settings, and had taken a couple of picture mainly to see the camera was working ok, and I moved back to where I’d been sitting and saw this scene. The lighting was interesting, if slightly impossible, but it was the disposition of the people and their various gestures that moved me. I took two frames quickly, and the second was slightly more interesting, with very minor changes in position, particularly of the figures at extreme right and left who had moved slightly to become more a part of the group, and the man in the wheelchair at the far corner of the table had turned his hear more towards me. Also, the two customers entering – nothing to do with the protest – were now neatly centred in the gaps between the figures in the group. Little things like this can make a big difference, and I was lucky that things had come together. It was still a challenging image to process, with light from both the internal lighting and through the large windows (enough to give me an exposure of 1/200 f5,6 at ISO 640) at rather different colour temperature, and the scene through the window rather over exposed – about 3 stops brighter. Of course I wanted it to be brighter outside, but it took quite a lot of burning in to get it to the level you see – and there are still one or two areas where I might have gone a tad further. I needed to increase the contrast, and also lighten the group around the table, and to play a little in places with the colour temperature. Perhaps I’ve taken it just a little too far, made it just too painterly, but I think it works without really seeming artificial. A few minutes later I took another picture which appeals to me. The protesters had gone outside, and had a little meeting to discuss what they were going to do, asking the photographers including myself to give them a little space. 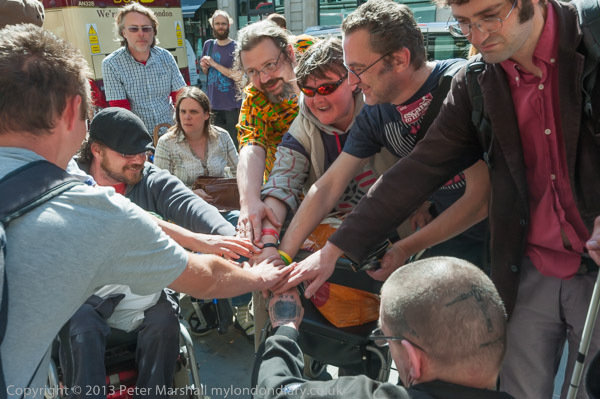 We stood around talking about this and that – photographers often spend a lot of time talking to each other – and then I realised the meeting was coming to an end, and moved in to take a picture as they joined hands in a gesture of solidarity before starting their protest. The lighting was very contrasty, and it took quite a lot of careful burning in to get details in the sunlit skin, but I was pleased to have got the picture, which I think shows very much the spirit of these activists. 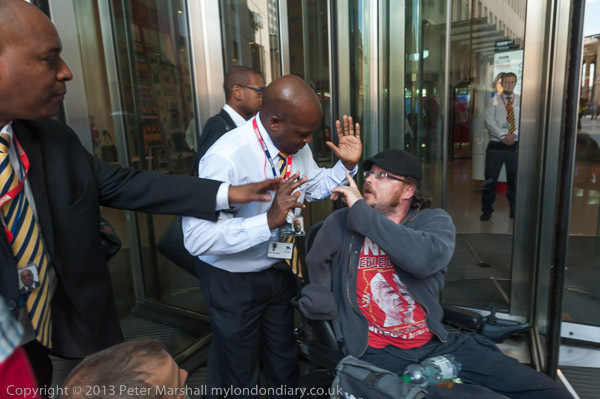 The protest DPAC at BBC – Tell The Truth went well, though unfortunately nobody inside the BBC would come out and discuss their grievance at the biased coverage of the cuts and in particular the disproportionate affect they are having on the disabled. The protesters blocked the main entrance for some time, bringing their protest to the notice of those who had to find their way around inside the building to another entrance, and other BBC staff probably had to delay their afternoon tea breaks in the cafés in the courtyard. The protesters stopped an attempt by BBC security to use force to remove them by threatening to bring charges for assault. Finally the BBC did take some action – they called the police, and also asked a freelance who had been working on another job for them to take some video of the protest, though it wasn’t to be for the news (I did suggest to him he might sell it to Sky or RT.) The police came and had a chat, and the protesters agreed to leave in a few minutes after they had been protesting for an hour, and did so. The police watched them but made no arrests. It was all very civilised, and you can see my pictures and more comments on the protest in My London Diary, but I think the two pictures above before the actual protest were my best work from the day. This entry was posted on Saturday, September 28th, 2013 at 10:05 am and is filed under My Own Work. You can follow any responses to this entry through the RSS 2.0 feed. You can leave a response, or trackback from your own site.